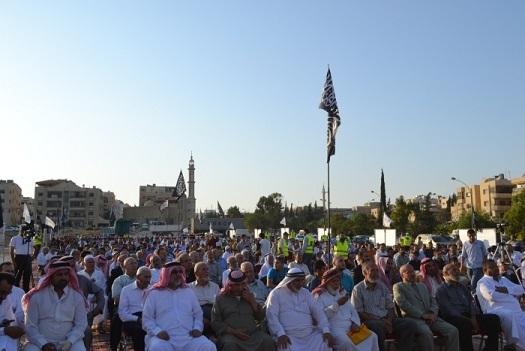 "Our Islam Not their Democracy"
Alhamdulillah, the assembly of speeches that Hizb ut Tahrir Wilayah of Jordan called for in order to condemn the American intervention in Syria and to denounce the crimes of its agent Bashar in Syria and the crimes of its agents the rulers in Egypt, has concluded. 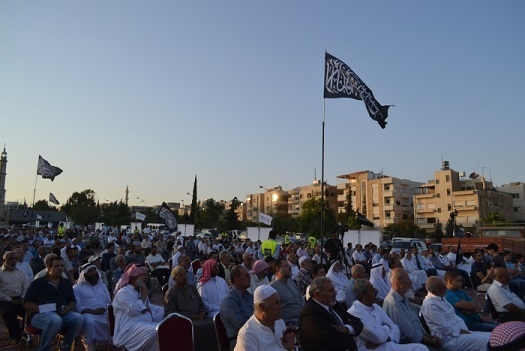 A large gathering from the sons of Jordan of Ash-Sham answered the call of the Hizb. 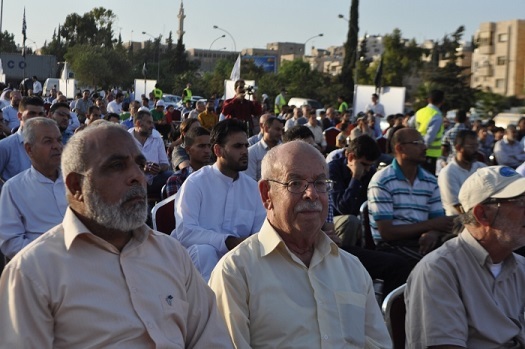 A large number participated in the activities of the assembly despite the rise in temperature. The assembly commenced by recitation of verses of al-Zikr al-Hakeem (Qur'an). 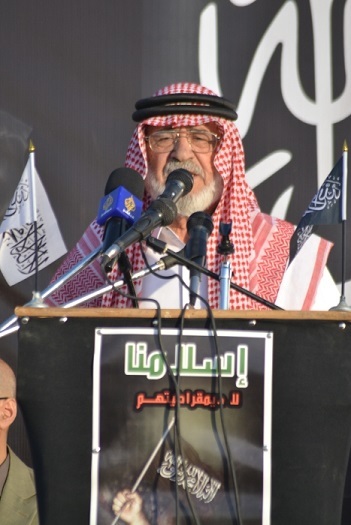 Then the speech of the Head of the Media Office of Wilayah of Jordan, Brother Mahmoud Qataishat followed; in his speech he warned the Muslims from relying on the Kuffar, as stated in his speech: "Here is America and all the Kaffir states from behind waging a fierce crusade on Islam and the Muslims by its own hands and those of its agents and henchmen in the Muslim land. Here it is killing Muslims in Afghanistan, Pakistan, and Yemen with its weapons and drones. And it kills Muslims in the land of Ash-Sham by the hand of its tyrant agent Bashar and it supplies him with all the means in order to survive. And it kills the Muslims in Egypt by the hands of its agent the tyrant As-Sisi in Rab'a al-Adawiyah, Nahda, and on the streets and mosques." In his speech he warned the Muslims from accepting or allowing the Kuffar from the East and the West from interfering in the affairs of the Muslims under any pretext or name whether it is military or political, because this is a betrayal to Allah, His Messenger, and the Believers. He also called the Muslims facing this tragic reality to uproot the rulers and work for the return of the Islamic authority and to establish the Khilafah state that will cut off the hands of America and the other Kaffir states that are meddling with the Muslim lands. Brother Bilal Al Qasrawi also delivered a speech speaking about the role of America to supply the butcher Bashar with all the means of power and survival and how it conspires against Ash-Sham revolution. And in his speech he commended the sincere revolutionaries in Ash-Sham and said that they will not be fooled by the attempts of America to isolate their revolution and its demand to manufacture a new agent. Brother Abu Bakr Fuqaha' continued with his speech, in it he warned the Muslims not to rely on the kufar and he directed an advice to the Islamic Movements in Ash-Sham and Egypt to not accept a compromise in any part of their Deen and that their aim must not just be to overthrow or elect a ruler or sit on the Ruling Chair, but instead their aim must be to implement the Shar' of Allah (swt) by establishing the Khilafah s There were slogans raised and they included: "The revolutionaries of Ash-Sham said it: ‘We will not change our Deen for your democracy. 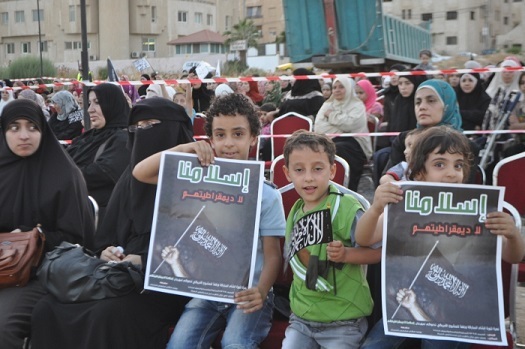 '", "Until when will my blood in Ash-Sham and Egypt be sacrificed for the West? ", "They lied and said:" The solution is in democracy, so the result was the massacre of Rab'a Al- Adawiyah" and "Your intervention is an aggression and an aid to your helpers". The local and international Media covered the assembly that had a noticeable security presence. Media outlets conducted many press interviews with the Head of the Media office and a number of participants. "ہمارا اسلام نہ کہ ان کی جمہوریت"